Tucson Daily Photo ~: NEW CLUE: Time for another "Where is this?" OK Tucson lovers ~ here's another "Where is this?" contest. We are looking at a place that has several restaurants to choose from. Where ARE these colorful umbrellas? First one to identify this location wins a "fabulous" TDP t-shirt (or mousepad) with the "Monday Already?" ram image. Good luck! No positive ID yet so here's some more info to help you. This area has a name of its own.... "-------- Square" and the restaurants there all have indoor and outdoor dining. This area also has some unusual benches.... Good luck! Sigh. No clue but I wish I was there! Is it up at La Encantada - that cul de sac with all the restaurants? I meant Main Gate Square. Hey there Kathy from Boston ~ You are the WINNER of this "Where is it?" contest!! Congratulations to you! This area is referred to as Main Gate Square and/or Geronimo Square and it is a charming area that includes Joel's Bistro, Sinbad's, etc. Kathy - please email me at TucsonDailyPhoto@gmail.com and give me your mailing address and your preference of either the TDP t-shirt or mousepad. 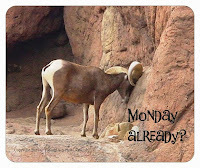 Both feature the "famous" ram asking, "Monday already?" CONGRATULATIONS! of course I'm still enjoying the shirt AND the mouse pad! I thought it was Geronimo, but as mentioned it's been so long. Tucson is changing so quickly...parts of downtown and university areas are unrecognizable. And I live here, just a couple of miles north of UA!